December 21. - Today we are decoration our christmas tree. A real tree decorated with lights, Danish flags and pleated hearts. 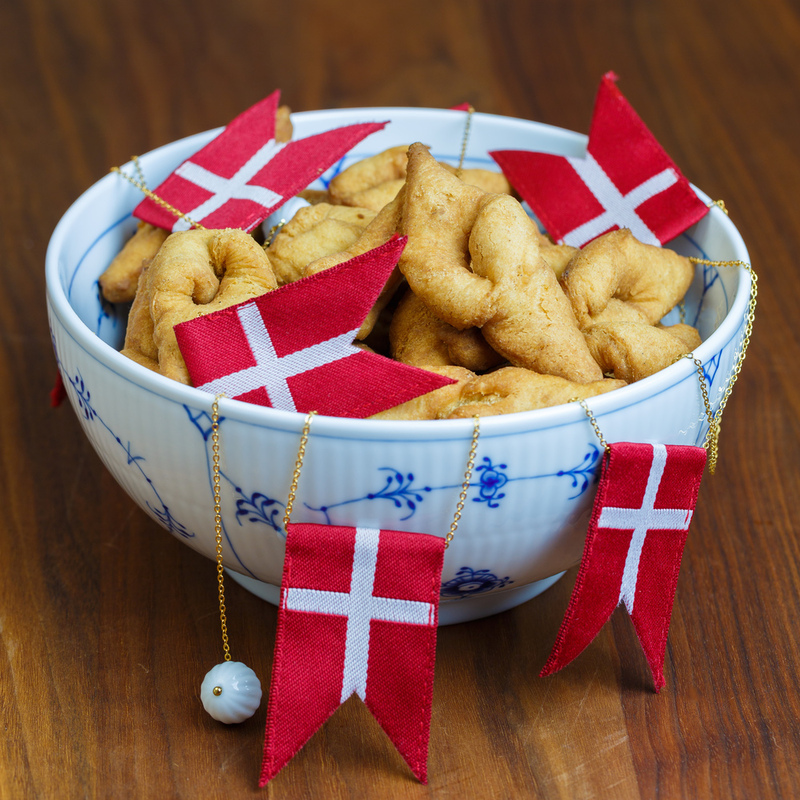 Klejner is the oldest of the danish christmas cookies. You were able to make klejner in a pot of fat over the fire, so there was no need for a stove. My dad loved klejner, but my mom thought they were to much work to make. So for many years my dad made klejner, one of the few thing he ever made in the kitchen. Cream the butter with the sugar in a stand mixer with a paddle, till it's light and fluffy. Add one egg at a time, making sure that it's incorporated before adding the next. Mix in cream and cognac. Add bakers ammonium, flour, cardamom and lemon zest and mix until you have a firm dough. Wrap the dough in plastic wrap and leave it in the refrigerator over night. Divide the dough into 2 balls. Roll the dough out forming a rectangle about ⅕ inch (5 mm) thick. Cut the dough into 1⅕ inch (3 cm) wide strips with a knife, pizza cutter or a klejnespore*. Cut the strips into 3⅕ inch (8 cm) long rectangles, make a ½ inch (1½ cm) slit in it. To make a klejne carefully open the slit and pull one end of the rectangle through the slit to form a knot. Do this with all klejner. Set the klejner side by side on a baking sheet lined with parchment paper. Heat up the oil to 170-180℃ and fry the klejner until golden brown. Let the excess fat drain off on some paper towel. The klejner will keep for about a week, in an airtight container. * A klejnespore is a special pastry cutter that makes the perfect size dough strips and make a slit in the middle of the dough strip.